The most difficult case in troubleshooting is when no problem symptoms occur. In such cases, a thorough customer problem analysis must be carried out. A simulation of the same or similar conditions and environment in which the problem occurred in the customer’s vehicle should be carried out. No matter how much skill or experience a technician has, troubleshooting without confirming the problem symptoms will lead to important repairs being overlooked and lead to mistakes or delays. For example: With a problem that only occurs when the engine is cold or occurs as a result of vibration caused by the road during driving, the problem can never be determined if the symptoms are being checked on a stationary vehicle or a vehicle with a warmed−up engine. Vibration, heat or water penetration (moisture) is difficult to reproduce. The symptom simulation tests below are effective substitutes for the conditions and can be applied on a stationary vehicle. Important points in the symptom simulation test: In the symptom simulation test, the problem symptoms as well as the problem area or parts must be confirmed. First, narrow down the possible problem circuits according to the symptoms. Then, connect the tester and carry out the symptom simulation test, judging whether the circuit being tested is defective or normal. Also, confirm the problem symptoms at the same time. Refer to the problem symptoms table for each system to narrow down the possible causes. 1. 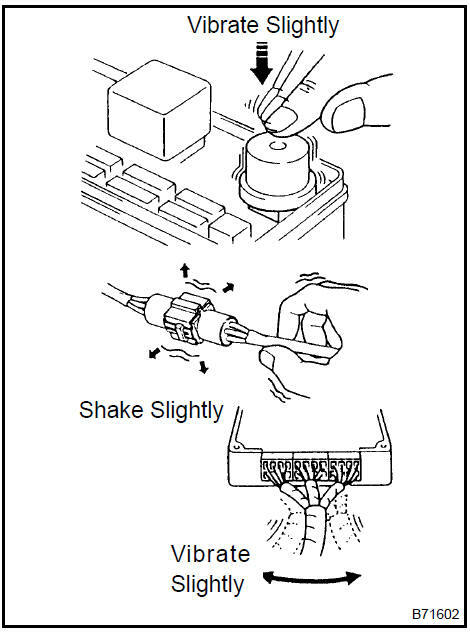 Apply slight vibration with a finger to the part of the considered to be the cause of the problem and check whether or not the malfunction occurs. Applying strong vibration to relays may open relays. 1. Slightly shake the connector vertically and horizontally. 1. Slightly shake the wire harness vertically and horizontally. The connector joint and fulcrum of the vibration are the major areas that should be checked thoroughly. 2. HEAT METHOD: If the problem seems to occur when the area in question is heated. a. Heat the component that is the possible cause of the malfunction with a hair dryer or similar device. Check if the malfunction occurs. NOTICE: Do not heat to more than 60 C (140 F). Exceeding this temperature may damage components. Do not apply heat directly to the parts in the ECU. 3. WATER SPRINKLING METHOD: When the malfunction seems to occur on a rainy day or in high−humidity. a. Sprinkle water onto the vehicle and check if the malfunction occurs. Never sprinkle water directly into the engine compartment. Indirectly change the temperature and humidity by applying water spray onto the front of the radiator. 4. HIGH ELECTRICAL LOAD METHOD: When a malfunction seems to occur when electrical load is excessive. a. Turn on all the electrical loads including the heater blower, headlights, rear window defogger, etc., and check if the malfunction occurs.